1. Dow 25,000? : The Dow has been flirting with the 25,000 point barrier for a few trading sessions now. Will it go over the top on Friday? 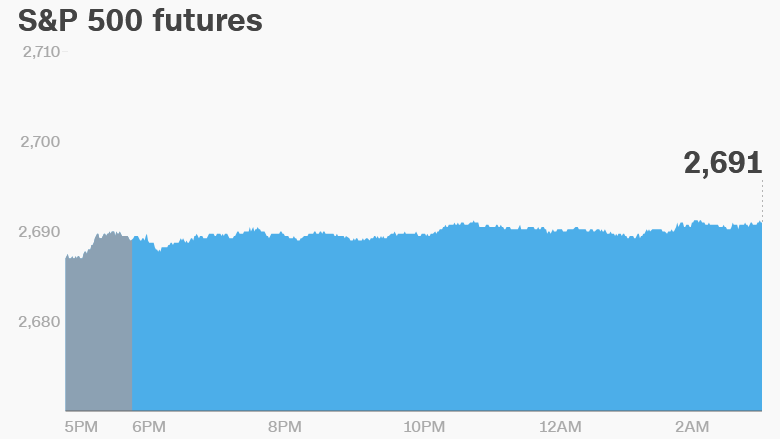 U.S. stock futures were pointing higher, but the index will still need to gain roughly 218 points to reach the milestone. Regardless, investors have a lot to be thankful for. The Dow, S&P 500 and Nasdaq have all gained 20% to 30% so far in 2017, and each has hit a record high this week. 2. Global stock markets: European markets dipped in early trading. Spain's benchmark IBEX 35 led the way with a drop of roughly 1%. Investors are nervous about the future of the Spanish region of Catalonia, where voters backed pro-independence parties during an election on Thursday. The euro lost ground against other major currencies following the vote. Most Asian markets ended the day with gains. 3. Bitcoin's wild ride: Bitcoin prices briefly plunged below $13,000 on Friday, capping a stunning 24 hours in which the digital currency lost as much as 25% of its value, according to data from CoinDesk.com. Prices, which had approached $20,000 as recently as Sunday, bounced back to trade around $14,000 by mid-morning in London. The turbulence comes on the back of a few days of bad news for bitcoin, which has still soared by more than 1,300% since the start of the year. 4. Shutdown averted: The Senate approved a short-term spending measure Thursday night to keep the government open through January 19, avoiding a government shutdown ahead of a Friday deadline. 5. Departure lounge: Eric Schmidt is stepping aside as executive chairman of Alphabet (GOOGL), the parent company of Google. Schmidt, who has been with the company for 17 years, will remain on the board and continue to serve as a technical adviser. He was previously CEO of Google. Turning from tech to pizza, Papa John's (PZZA) founder John Schnatter will step down as CEO. Schnatter will stay on with the company as its chairman. Steve Ritchie, the current chief operating officer, will take over as CEO on January 1. The shakeup comes after a string of public relations debacles and slumping sales. 6. Takeover bet: London-based gambling firm Ladbrokes Coral Group announced it has agreed to be acquired by another British gambling firm, GVC Holdings. The deal is valued at roughly £3.2 billion ($4.3 billion). Shares in Ladbrokes surged earlier this month when it said it was in "detailed discussions regarding the possible combination of the two businesses." Friday -- Massive El Gordo lottery in Spain, University of Michigan's consumer sentiment report for December released at 10 a.m. ET.